Today I want to share with you the book that has me very excited. I did not know that I would be so fascinated by this book when I requested it. The year is 340 BC. A hunted, haunted Brahmin youth vows revenge for the gruesome murder of his beloved father. Cold, cunning, calculating, cruel and armed with a complete absence of accepted morals, he becomes the most powerful political strategist in Bharat and succeeds in uniting a ragged country against the invasion of the army of that demigod, Alexander the Great. Pitting the weak edges of both forces against each other, he pulls off a wicked and astonishing victory and succeeds in installing Chandragupta on the throne of the mighty Mauryan empire. History knows him as the brilliant strategist Chanakya. But history, which exults in repeating itself, revives Chanakya two and a half millennia later, in the avatar of Gangasagar Mishra, a Brahmin teacher in smalltown India who becomes puppeteer to a host of ambitious individuals–including a certain slumchild who grows up into a beautiful and powerful woman. Modern India happens to be just as riven as ancient Bharat by class hatred, corruption and divisive politics and this landscape is Gangasagar’s feasting ground. Can this wily pandit–who preys on greed, venality and sexual deviance–bring about another miracle of a united India? 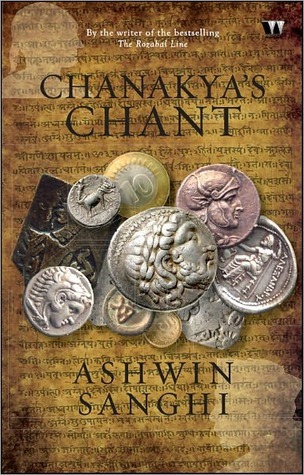 Will Chanakya’s chant work again? Ashwin Sanghi, the bestselling author of The Rozabal Line, brings you yet another spinechiller. I really was thinking about reading a few pages of this book, but now I just cannot put it down. I am still reading it, and it is awesome. Chānakya (Sanskrit: चाणक्य Punjabi: ਚਾਣਕੀਆ Cāṇakya) (c. 370–283 BCE) was an adviser to the first Maurya Emperor Chandragupta (c. 340–293 BCE), and generally considered to be the architect of his rise to power. Traditionally, Chanakya is also identified by the names Kauṭilya and Vishnugupta, who authored the ancient Indian political treatise called Arthaśāstra. It is important to identify Chanakya as a great Indian because his cultural significance has reached far and wide, and his words are just as internalised in other parts of South Asia. Chanakya has been considered as the pioneer of the field of economics and political science. In the Western world, he has been referred to as The Indian Machiavelli, although Chanakya’s works predate Machiavelli’s by about 1,800 years. Chanakya was a teacher in Takṣaśila, an ancient centre of learning, and was responsible for the creation of Mauryan empire, the first of its kind on the Indian subcontinent. His works were lost near the end of the Gupta dynasty and not rediscovered until 1915. If you have it available near you, I think you should go buy it right away. Have heard so much about the book and the author but a little skeptical about purchasing it after the last few Indian authored books I bought were so poorly written/edited. Waiting for your review. A new-to-me title. Thank you for sharing it. It’s Monday! What Are You Reading? and Readerbuzz’s August Giveaway! I hope you will stop by and join in Readerbuzz’s August Giveaway! I’ve heard a bit about this one too.. sounds intriguing.Flipkart deals are getting better by the day,right?.Do check out their 50% books tab,you might find something interesting there.. I love when books turn out to be better than I think they’ll be! OOH that book looks fantastic! I’m glad you’re loving it so much! Hadn’t heard of this one before but it sounds like a very interesting read. You’ll have to tell us how you liked it in the end! I never heard about this book but it sounds good. It does sound really good, and I can’t wait for your final thoughts. Hello mates, how is all, and what you wish for to say on the topic of this paragraph, in my view its actually amazing for me. There is certainly a great deal to know about this issue. I really like all of the points you’ve made. I may I want to counsel you few interesting things or advice. Thanks for finally writing about >Its Monday 🙂 <Liked it! I visited multiple blogs but the audio quality for audio songs present at this site is genuinely superb.